The two compositions presented here arc extreme contrasts, both musically and stylistically. They span the entire spectrum on the development of cello music over a century. Joseph Haydn (1732 -1809) wrote several cello concerti, of which the great concerto In D major is by far the most important and best known. It is the climax of this type of musical composition, since neither Mozart nor Beethoven composed any cello concerti. The concerto was attributed to Haydn, but this was debated for a long lime until it was confirmed by a manuscript now In the Austrian National Library. The concerto was probably written for Anton Krait, cellist of the Esterhazy Orchestra, who was also close to Beethoven. The structure of this composition conforms to the classic sonata form. The first movement is Joyful, with an elegant secondary theme. It is climaxed by the virtuoso cadenza. The slow second movement is characterized by inner cantilenas and impresses one with its simplicity. The third allegro movement proceeds coquettishly and lightly, ending in a flamboyant finale. The technical virtuosity required by the solist is so great that this early classical work (composed in 1783) with its bravura double stops and ample use of the highest registers of the Instrument, still belongs to one of the most difficult but gratifying works of its kind. 100 years later in 1888, the not yet 20 years old Hans Pfitzner (1869-1949), dedicated a cello concerto to his fellow student, friend and cellist Heinrich Kiefer. It was never performed, due to several unfortunate circumstances and was presumed lost. It was accidentally rediscovered In 1975 in Vienna by Wolfgang Osthoff and had its world premiere in 1977 in Würzburg. The concerto has only two movements, which are subdivided and its characterized by melodious, searching forms, sudden energetic outbursts, virtuoso solo passages and a soft understated finale, returning us to the beginning of the first movement. The pleasant sounding, problematical, musically expressive composition is a valuable addition to the limited number of cello concerti available today. These two extremely contrasting pieces have deliberately been presented together In Haydn’s adult composition, there is a clear division Into three movements, joyful playfulness and contemplative music pleasing to the listener; the Pfitzner concerto is dominated by brooding late romanticism, the abending of classical forms, the conflict between Brahms and Wagner, youthful discontent and the rebellion of an angry young man. Esther Nyffenegger‘s premiere performance of the Pfitzner concerto in 1977 was conducted by Hermann Dechant. Both artists also perform on this recording. The cellist, born in Zürich, has gone on extensive concert tours in the West and in far east and has made many recordings ranging from Barock to contemporary (including the Sutermeister concerto which was dedicated to her and the rococo variatins of Tschaikowsky on the COLOSSEUM label). She belongs to the most prominent of today’s cellists. Hermann Dechant was born in Vienna and is a conductor, musicologist and university professor of conducting. He has conducted many German and foreign orchestras and recorded music ranging from Renaissance to modern music as a researcher, he is involved in publishing late romantic music. Esther Nyffenegger, born in Zürich, Piano certificate by Pina Pozzi, Winterthur. Concert certificate for Cello by Richard Sturzenegger, Zürich, further studies with Eva Janzer-Czako. Master clases with Pablo Casals and Enrico Mainardi. Soloist Prize of the Schweizerischer Tonkünstlerverein. Second Prize at the International Casals Competition in Israel. Soloist of the Festival Strings Lzcerne, concert tours throughout the Western world and Oversea. Various Chamber Music Ensembles from trio to octet. Multiple radio records and concerts, worldwide. She held classes at the Conservatories of Lucerne and Winterthur. 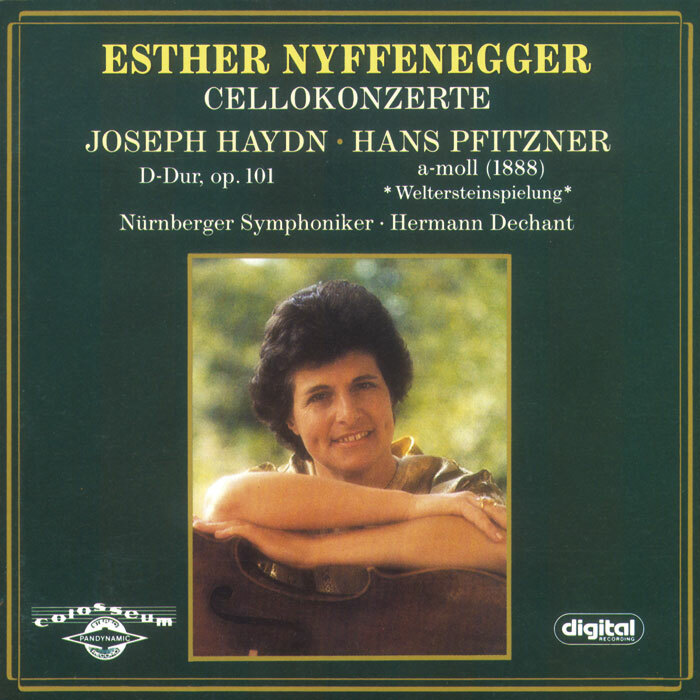 In 1974 Esther Nyffenegger premiered the second Cello-concerto which was written for her by Heinrich Suttermeister, with Wolfgang Sawallisch conducting. She travelled in 1982 with the Tonhalle-Orchester Zürich to Hong Kong, Pekind and Shanghai. In 1977 she played in Würzburg for the first time the Cello-concerto by Hans Pfitzner dated 1888 which was for a long time considered as lost. From 1983 till 1986 Esther Nyffenegger was given a guest chair at the Tokyo University for Fine Arts and Music. During this period she gave many concerts in Japan. Konzert für Violoncello und Orchester a-moll, op. posth.